Ahh! Products bean bag chairs are sure to be a favorite from toddler years and last through college. Ships within contiguous USA only. This 36" wide bean bag chair is perfect for kids, but will seat adults. 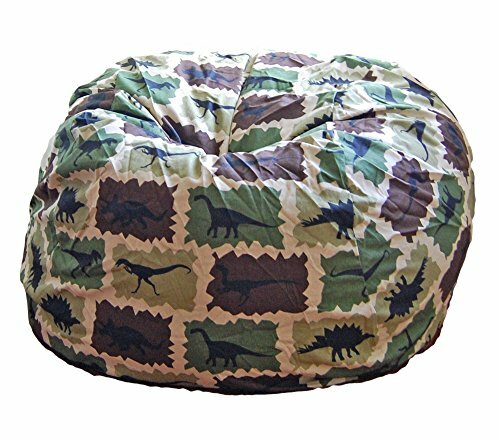 Features a cotton, fully-washable cover printed with black dinosaurs fossilized in camouflage colors of dark brown, hunter green, and olive on a cream background. The seams are double-stitched for superior strength, no ripping or breaking even with the toughest play. Under the cover is an Ahh! Products exclusive liner that repels liquids in case you spill something. Your filling will stay safely inside the liner, since it's strong enough to hold up to rough play. Liners come with child-resistant zippers that lock and unlock, so you can keep curious children out. The cover and liner are double-stitched and will not break or leak like other bean bags do. All backed by our awesome 1 year warranty. Don't buy a cheap bean bag and regret it, real value is long-term durability. Filled with 100% polystyrene pellets that vary from 1/8" to 1/2" that are brand new, but re-purposed, making the bean bag "greener". Bean bag is round and sewn like a baseball, not pear or egg-shaped. Warranty excludes compressed filling. Bean Bag Chair - Super comfortable and cozy. This Oversized Lounger Bean Bag will be a great adult or kids bean bag. Beacuse of the 8ft size it can be used as a bean bag sofa. Not a slacker bean bag, just a great overall big bean bag chair.